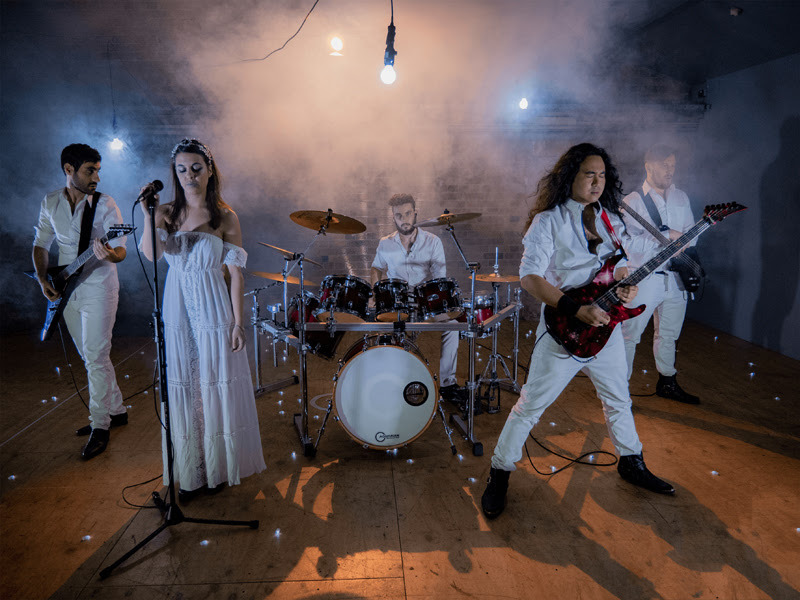 Brisbane symphonic metal outfit Seraphic are today revealing their filmclip for new single "The Monster Within" (out now at Spotify, iTunes/Apple Music, Amazon, Google Music, Deezer and Pandora!) and announcing their Single launch show Friday October 12 at Woolly Mammoth! Tickets are on sale now for the epic, operatic night at Woolly Mammoth's site. In this brand new single, Seraphic build upon their core, quintessential instrumentation - soaring soprano vocals, lightning guitar solos, memorable melodies and keyboards as a driving melodic force - but the addition of more prominent rhythm guitar grooves and harsh vocals cements the framework for a stronger, darker and more modern take on traditional symphonic metal. The vision for "The Monster Within" video was simple: a visual representation of the darkness within us slowly taking over, and our ongoing battle to never give in. Imbued with an overarching theme of duality, the six-minute film is a feast for the eyes with its fleeting, unpredictable flashes between shadows and light, and the abstract personification of one’s dance with the devil. The narrative is actually represented through dance, and the ongoing, intense struggle illustrated by the dancers is elegant yet powerfully compelling. The video ends somewhat ambiguously, leaving it open to the interpretation of the viewer as to whether the darkness ultimately takes over, or whether the real struggle is learning to accept the light and dark that is within us all. Operatic vocialist Sam Wolstenholme said that the new track The Monster Within is "...an incredibly significant and deeply personal track for me. I wrote this song when I was going through quite a dark time in my life - and I realised I wanted, and needed, to make some major changes not only to my life, but also within myself. Since then, things have changed for the better for me, and I've been able to channel a lot of that personal growth into my craft and creative process. So, releasing this track is a really important milestone. I'm so proud of the track. The lyrical content deals with some very heavy and explicit themes of addiction, which I have used as a kind of analogy to represent the internal battle with our demons that we all face at some point in our lives, and the intent is that at least on that level, it's relatable and cathartic for listeners!" Seraphic worked alongside Chris Themelco from Monolith Studios after hearing his production work for bands like Trigger, Espionage and his own band Orpheus Omega and the amazing filmclip was produced by SilentDez Productions. Wolstenholme went on to praise the production house and their process. "They nailed our shadows-and-light/internal struggle/duality brief and worked really hard to get the very best product they could according to our requirements. The dancers we hired were phenomenally talented, and overall, everyone in the team pulled things together so beautifully." Seraphic came into existence in 2015 - and their career so far has seen them take the stage alongside bands such as Queensryche, Wednesday 13 and Overkill - and co-headline Ye Gods of Metal Fest and Darkcell's debut Psycho Circus festival and embark on a highly successful Australian East Coast Tour. 2017 saw Seraphic release their debut album "Journey to Illumination" to rave reviews, followed by a hugely successful album launch show at New Globe Theatre. 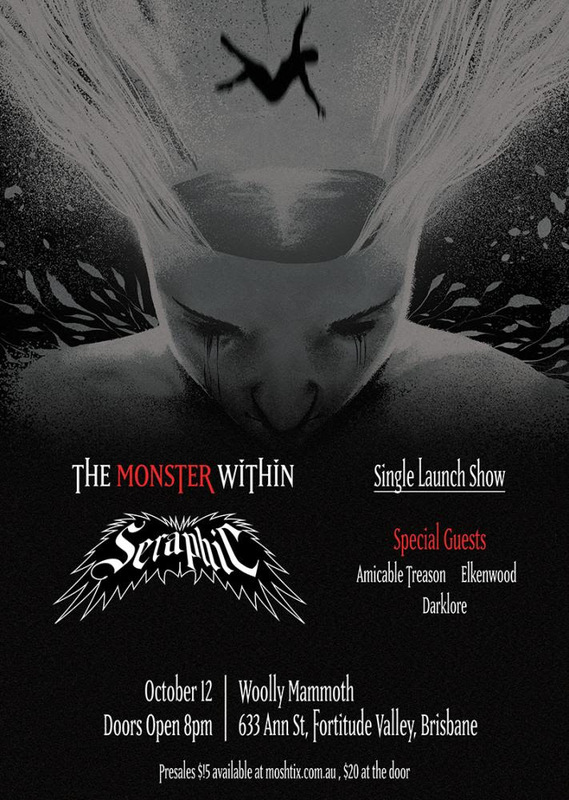 Seraphic's new single "The Monster Within" is available online now for streaming and purchase at Spotify, iTunes/Apple Music, Amazon, Google Music, Deezer and Pandora and tickets for their single launch are on sale now at Woolly Mammoth's site, Tickets for Halloween Hysteria are available at Oztix and tickets for Kamelot's show are available at Oztix as well.